Robert progressed through the youth system at Watford and made his debut in 1993. He went on to captain the side to two successive promotions and into the Premier League in 1999, when he also won the Player of the Season award. He was transfer listed by Luca Vialli in 2001 and moved to Sheffield United early in the following season. Currently managing the Wales u21 side, Rob spoke to Watford Legends while playing at Chesterfield in 2008. Hi Rob, you’re a Welsh lad who came through the Watford youth system. How did that come about? I was there when Tom Walley was involved in the youth set up, and initially when I was 11 I started coming back and forth from Wales, and I would stay with a lovely couple, John and Brenda Booker. They used to look after me and it was a home from home. When I was 15 I signed the schoolboy forms, and when I was 16 I was lucky enough to be offered an apprenticeship. Kenny Jackett was my youth team manager at the time – I think he had just finished playing himself. So you’ve had quite a good Watford upbringing with Kenny and Tom. Oh yes definitely. They are two men I hold in very high esteem. They are strong characters, and as a youngster they talk to you in the right way. Do you remember your first team debut? Yes, it was Birmingham City away. I remember we lost 1-0, and I played at right back when Glenn Roeder was manager. I recall Ted McMinn was coming to the end of his career and I played up against him. I remember it all very well. I was only 17 or 18 and in the big St Andrews stadium. To be there playing for Watford was a dream come true. It is a very fond memory. You then went on to make a lot of appearances and be our captain. That’s right; I was in and out of the team for a while whilst we had Dave Holdsworth and Colin Foster, so I’d get a few games only if they were out. Kenny then took over as first team manager and I started to establish myself. He also appointed me as captain. The season after that Graham came back downstairs to run the team and kept me in as captain. We got the promotion after that memorable win at Fulham on the last day. I remember the league took the trophy to Preston ready to give to Bristol City! I remember I could not play at Craven Cottage as I had a dead leg I picked up the week before. We were in the stand for the game but we soon went on the pitch with the other lads afterwards! And then on the up to the Premiership. We had a great run toward the end of the ’99 season that just nicked us the sixth spot. The two games against Birmingham in the play offs were fantastic entertainment, if a little nerve wracking. I remember taking the penalty in sudden death. We won the shoot out and then we topped it all off with our trip to Wembley to beat Bolton. It was absolutely unbelievable. Stuff dreams are made of. Was that the biggest game of your career? Without doubt. I’ve been lucky enough to play for and captain Wales as well. But to win two consecutive promotions and to walk up the steps at Wembley and lift that trophy was one of the proudest moments of my life. Like a couple of years ago, we finished bottom of the Premier League in 1999-2000. Why do you think that was? 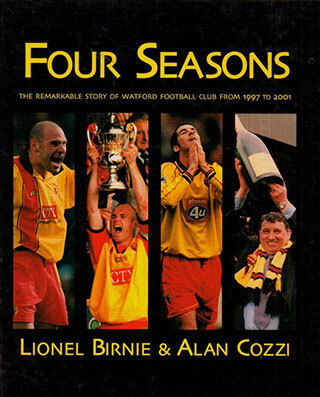 Every game was like a cup final for us, and I think that Graham at the time thought that much of Watford as a club that he was not prepared to compromise with any finances and gamble to stay in the league. People expected him to throw money at it but he was not prepared to take that risk. It was not great being beaten every week but we knew it was going to be difficult after two consecutive promotions. I think when Vialli came in he showed what a gamble spending a lot of money can be. He threw money at big players who didn’t perform. I thoroughly enjoyed my year in the Premiership though. Memories like that one we have of winning at Anfield are special. That squad from 1997 to 2000 was a great squad wasn’t it? It was. We had some great lads like Nicky Wright, Smarty, Jonno, PK and Steve Palmer. We had a fantastic team spirit. We also had Kieran, who was our pink-shirted sports psychologist who came in to help us! What was his role day-to day? He would just make sure that our minds were right for playing football. A lot of your preparation for a game is in the head and he would ensure that we were ready. He also made sure we were all in it together and he had a big impact in the team spirit of that squad. We would do group and individual sessions with him. Are you still in touch with any of the old lads? I speak regularly to Paul Robinson, and catch up with Chambo every now and again. Vialli came in and pretty much froze you out straight away. Fair comment? Definitely. I knew from the first minute that I wasn’t going to be in his plans. He made that quite clear. Maybe looking back if I’d swallowed my pride I could have waited in the wings until he was sacked and then carry on. But I am the sort of person that if I am told I am not wanted I will leave. I don’t want to sit in the stand. I had a call from Neil Warnock who was at Sheffield United and I went on my way up there. What’s Neil Warnock like? It seems that he is a pain in the arse to be against but is great when he’s on your side. You’ve hit the nail on the head. He is a pain in the arse when you see him getting involved from the side lines but it’s great when he’s with you. He is a motivator, and always has a good team around him, and between him and his team they get the job done. I would not say he is the best tactician around, but he knows how to get results. His record speaks for itself. We couldn’t possibly guess what you mean by that! Come to your own conclusions on that one boys! You then went on to Cardiff, but without many games there. I saw a club that was going forwards and wanted to be part of it. In my first couple of games I broke some ribs and at that time James Collins and Danny Gabbidon were coming through. They stayed in the team, and rightly so, as they were doing a great job then. They both got a great move to West Ham. I put the feelers out and managed to get a good move to Coventry and had three great years there. And it was whilst you were at Coventry when you had a bit of an infamous moment when you put a bit of a tough tackle in on Ashley Young. I remember that game, yes. It escalated in to a bit of a ruck at the end. It was a whole hearted tackle, but I didn’t mean any harm. I could see why it could be a straight red card now as it was two footed and it was a bit of a lunge, but I could promise I didn’t want to hurt Ashley. Did that incident sour your relationship with a few of the Watford fans? I have a lot of time for Watford and they are the first result I look out for on a Saturday. They also made me in to a professional footballer so I am forever in their debt. I hope I haven’t upset any Watford fans. I only promise it wasn’t sinister, and the fans that know me will know I didn’t mean it. You then went to Huddersfield before going to Chesterfield. Iain Dowie came in and didn’t fancy me – there’s a pattern forming here! – and I had the option to go to Huddersfield in the January and I loved every minute of it there. I had four good months and they offered me a contract. But then Chesterfield came in and offered me a longer deal, possibly up to three years which is good when you are 32. Chesterfield are also looking good for the future with a new stadium being built, and big plans for the future. How much longer do you realistically expect to play for? I plan to keep playing until the legs give up. I’ve looked after myself well as a pro so my body can do a few more years yet I think. Hopefully the dedication I put in to being a pro when I was young will give me that extra couple of years at the end. What do you plan to do when the time finally comes? I’ve only ever known football as a living, so it’s tough. But I’ve just done my UEFA B badge down in Wales and plan to do the A badge next summer. I certainly want to stay in football in some capacity. What role would you like in football? I’d love to start by coaching the kids, a bit like Kenny did with me. Now Kenny’s doing a great job at Millwall as manager, so I’d love to do something similar in terms of career path. You’ve moved around a fair bit with the career. Will you stay in Sheffield now? We went back to Wales for a couple of years when I was at Cardiff, but you don’t want to move too much, especially when you have young kids. So we’ll stay in Sheffield, certainly for the time being. Good stuff. Thanks for your time!